Army Pfc. 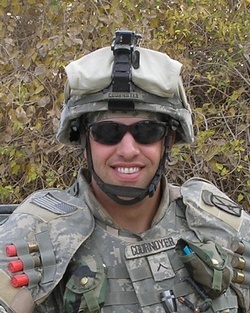 Nicholas Cournoyer - Run for the Fallen New Hampshire, Inc.
Nicholas was born in Concord and grew up in Gilmanton, graduating in 2000 from Gilford High School. In the yearbook, he listed joining the military as one of his goals. Faculty members remembered him fondly. “He just had a happy presence in school,” school nurse Meg Jenkins said. “He was very polite, very kind — always had a twinkle in his eye.” Nicholas worked as a mason’s assistant in the Laconia area. He bought a truck that he had fixed up and paid off. He joined the Army in January 2005 and was an infantryman with the 10th Mountain Division based in Fort Drum, NY. “He was fun-loving, and he had a huge heart that reached out to many, many people,” his sister Natalie recalls. Longtime Gilford educator Don Engelbert said Nicholas had a highly developed sense of right and wrong that stood out to his peers and teachers. He found a niche in the military. Nicholas had planned to buy a Harley-Davidson after his tour ended and had wanted to join the National Guard. He enjoyed music, partying, concerts, playing pool, lifting weights, running, his truck, an annual canoe trip and being with his family and friends. 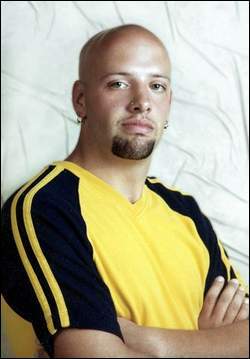 Nicholas entered the Army in January 2005 and trained at Fort Benning, Ga., to serve in the infantry. His awards and decorations include the Purple Heart, Army Achievement Medal, National Defense Service Medal, Iraq Campaign Medal, Global War on Terrorism Service Medal, Army Service Ribbon and the Combat Infantryman Badge. Donations can be made to the Nicholas R. Cournoyer Scholarship Fund at Gilmanton School c/o Maureen Delaney. 1386 NH RT. 104, Gilmanton Iron Works, NH 03837. He is survived by his parents, Denis R. and Lenda A. Cournoyer, of Gilmanton; a sister, Natalie A. Cournoyer, of Meredith; his grandmother, Vivian A. Newton, of Laconia and many aunts, uncles and cousins.